It was Friday, July 1st, around 3pm, when I picked up my two companions Katharina and Simon at the Physics institutes to drive together with them to my second Sansuikai seminar, this time to Antwerp.In spite of heavy traffic and delays, and with the help of Simon’s navigational skills and chatter from the backseat, we finally arrived on time for the evening aikido classes taught by Senseis Peter and Manolo, which started at 7 pm. After this intense seminar start it was time for a nice pizza evening at the dojo with the quarter final soccer face-off between Belgium and Wales Unfortunately for our Belgium compatriots Belgium lost. After a good night’s sleep and a hearty breakfast we hit the mat Saturday morning. We enjoyed a dynamic morning class with Gyakkyu-hanmi techniques taught by Jesús Sensei as well as Tanto-defense-techniques against Jodan Tsuki by Jules Sensei from Stuttgart. For lunch break we had baguette bread and bananas to recharge our batteries to prepare for the following three afternoon classes. The first one was taught by Peter Sensei, our host instructor of the seminar, followed by Manolo Sensei from Mallorca, and finally a last class by Jules Sensei. The last lesson was quite special, since Jules Sensei taught defense techniques against kicks from the side, which was a challenge for both uke and nage. We surely had some laughter on our side due to the “interesting” ukemi. Now I know that Yonkyo also works on the lower leg and that Aikido at times can look like Wrestling. After a long day on the mat and a delicious dinner prepared by Gary’s wife it was time for fun and celebration as we all joined for Peter Sensei’s “50-40-30 party” at a location nearby. The party was a celebration of his 50th birthday, 40th year of practicing Aikido and 30th anniversary as an Aikido instructor. Sunday morning we started the last day of the seminar relatively fit. As before, the three remaining classes were taught by different instructors. The first class started with Manolo Sensei, followed by Peter Sensei. 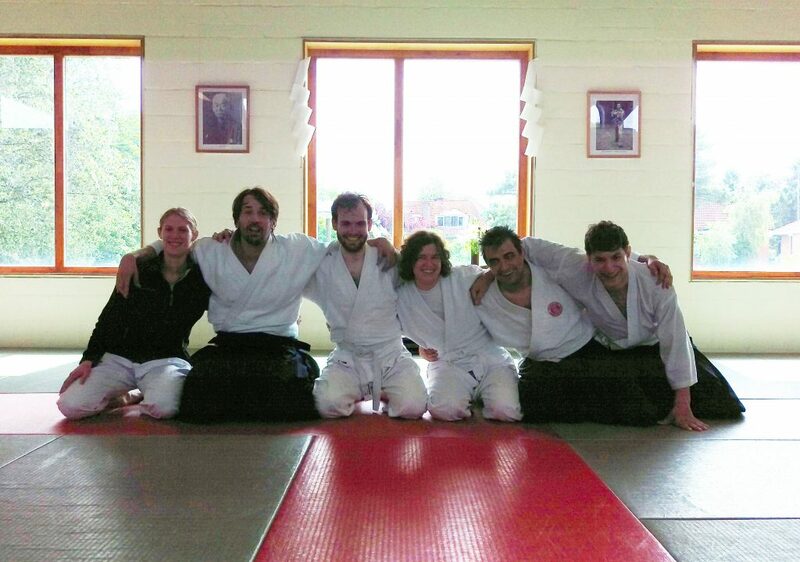 At lunch break the group from Stuttgart left already since they had a long way back home.In the afternoon the remaining participants – including us – focused on their breakfalls and ukemi for Koshi Nage during a class taught by Edo Sensei from Eindhoven. After preparing exercises how to do proper ukemi we continued with ukemi from Koshi Nage. Being at the end of the seminar this was surely an exhausting class but at least speaking for myself Koshi Nage lost some of its scary aspects.Last but not least, we had a bit shortened last class by Jesús Sensei, said goodbye to everyone, bought some original Belgian French fries and left for our journey back home to Muenster, where we arrived close to 9 pm. Reflecting upon the seminar it was a great opportunity and experience with its nice atmosphere. Compared to my first Sansuikai seminar in Brussels with Yamada Sensei with more than 150 people attending it was more intimate and personal with around 40 participants. I had the chance to get to know other aikidokas from different Sansuikai dojos not only on but also off the mat. Furthermore, the seminar was very interesting by itself since it brought together aikidokas from five different countries. Despite the smaller seminar size we had lots of opportunities for great practice and the chance to train with high-ranking aikidokas and instructors. Like the previous one, this seminar was inspiring and a lot of fun. With this experience I’m very much looking forward to the one-week summer-camp with Yamada Sensei in Bernau end of August, which will be surely the aikido highlight of the year.